Real bread has come to Cambridge! Since my first visit to the Jigsaw Bakery in Linton a month or so ago I’ve been going along pretty much every weekend for my fix of Matthew’s wonderful bread. The kind of brilliant bread that makes you want to run home as fast as you can and tell your husband about it because it is so good (yes I do always have a nibble of it as I am leaving the shop, naturally). I visited the bakery first during CamShopLocal so here is my promised post, dedicated to it! Matthew Whitby opened the bakery back in November, and I spotted the bakery Facebook page go up just before and watched the progress of the shop being fitted out. He’s part of the Real Bread Campaign – campaigning to bring back proper bread to the UK – handmade without additives or improvers. I’ve heard lots of people compare our bread to the continent and we are lagging behind, has the popularity of the soft white slice made us forget what proper bread is? Matthew sells a huge variety of bread from his tiny bakery – sourdough, flavoured sourdough, fruit breads, pain de campagne, ryes, wholemeal, breadsticks and even more – plus cakes, puddings and meringues. He also stocks and makes coffee, olive oil, bread flours, chutney and aprons from the lovely Cooking Gorgeous. We’ve so far tasted the sourdough, pain de campagne, tomato and cheese focaccia, currant malthouse and wild garlic focaccia. The focaccias are mega, and don’t last more than 24 hours in our house. The currant bread and the sourdough keep so well in an airtight container and see us through breakfasts and alongside meals during the week. We’ve yet to try the sweets but I’m sure we will do soon. Linton is about 10 -15 minutes drive from Central Cambridge, a lovely little village which has some exciting things going on. The Linton Kitchen has recently opened – a beautiful cafe which also sells local produce, and there is a butchers opening soon too. The Crown Inn is a great pub (good pies!) and they even have a little zoo! If you’re hoping to get some of Matthew’s bread do arrive around opening time (11am) because he does sell out quick. Also, if you drop him a note on Facebook he is happy to reserve a loaf for you, great service! This Pesto Pull Apart Bread is a real crowd pleaser, I think tearing big chunks of freshly baked bread slathered in pesto is just about anyones favourite thing to do. I took this bread along to The Secluded Tea Party Unbirthday this weekend as part of the pot luck spread, along with some sundried tomato palmiers (more on that soon). It looks kind of awesome, all big and gnarly on the table and tastes even more awesome. This bread takes time time to make but if you are confident enough making a normal bread dough then you’ll be fine here. It is quite a nice bank holiday activity, something you potter in and out of the kitchen at regular intervals to do the necessary stages. I’ve seen this as a sweet filling before too, filled with cinnamon sugar, and also in other savoury ways – sun dried tomato, cheddar & mustard. Mix together the warm water, yeast and oil in a large bowl. Leave for 5 minutes til the yeast starts to bubble. Then add the bread flour, sugar and salt to the yeast mixture. Mix well with a wooden spoon (or a mixer if you have one, I have one on my wish list!) until all incorporated in to a dough, add the egg in and mix to incorporate again. Your dough might be a bit wet here so add in some more flour to form into more of a kneadable dough. Knead lightly in the bowl for just a couple of minutes. You’ll not need to worry so much about kneading if you are using a mixer with a dough hook. Cover the bowl with a tea towel and leave in a warm, dry place for at least an hour to prove. It should double in size. You need to make your pesto now. Just blitz all the ingredients in a food processor or mini blender. Add some oil to begin with and then add more as you need to loosen the mixture. After proving knock back the dough, flour a board well and roll out thinly in a rough rounded square. Spread the pesto over the dough. Cut the dough into 4 long strips. Then pile the strips on top of each other, then cut into little square stacks. Then stack the little squares into a oiled and floured loaf tin. Leave to prove for another 30-40 minutes. Preheat your oven to 170c / gas mark 3. When it is proved bake in the oven for 30 – 35 minutes until golden brown and cooked through. Keep an eye on it in case it starts to brown too much, you may need to turn your oven down, mine went quite brown in the end. Remove from the tin about 5 minutes after it has come out of the oven. Cool on a wire rack. Tear into it when it is still slightly warm / as long as you can bear without eating it. I have baked a lot of bread before, no knead bread, one hour bread, soda bread, potato bread and various other things which have been eaten too quickly to blog about. But I never seem to get around to cooking a normal white loaf, you know one you can slice and use for sandwiches and toast. I guess because it is easy to get supermarket bread for that and make fancy bread homemade. But really baking an everyday loaf is really satisfying because you can include in your everyday meals to make them more interesting. This recipe has more water in than normal bread doughs and I proved it once for an hour, and second in the loaf tin for 45 minutes. This mean it was moist, very well risen and airy, I think if I’d left it the second time for another 15 minutes it would have bloomed a bit higher. I sprinkled it with poppyseeds for extra crunch and prettiness. Mix the dry ingredients together in a large bowl, then make a well in the centre and add the oil and water. 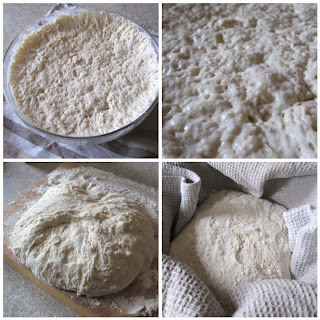 Slowly incorporate the flour into the well until it combines fully, mix to a fairly sticky dough. Flour a board well and knead the loaf for a few minutes until it is smooth, you may need to keep adding flour to stop it being too sticky. Put into a large clean bowl dusted with flour, cover with a tea towel and leave in a warm place for 1 hour. After an hour turn the dough out and knock it back, kneading lightly for a minute. Then shape into a rough loaf shape and pop into a floured loaf tin. Prove again for 45 minutes to 1 hour in a warm place, covered with a tea towel. Preheat your oven to 180c / gas mark 4 before the proving is nearly up. Once proved slash the top with a sharp knife, about 3 or 4 slashes should do. This will allow the loaf to rise and air to escape during cooking. Dab with some water or brush with milk and sprinkle on about 1 teaspoon of poppyseeds. Bake for 30 – 40 minutes in the middle of the oven. Remove from the oven, grab the butter, slice and spread and EAT! I think this bread would take really well to other flavourings such as cheese, herbs, sundried tomatoes, whatever you can think of. Sesame seeds and a drizzle of oil would be an nice twist too. The possibilities! I toasted it the next day and spread it with honey, it toasts extremely well. I love baking bread but my loaves never tend to be as light and fluffy because of my extremely poor kneading technique. I just don’t have the muscles! I must have come across this recipe for No Knead Bread about a year ago, I have no idea why it took me such a long time to make it. It came up on a few more blogs recently and so I set aside some time this weekend to make it. This bread is not about instant gratification, due to the first prove being 20 hours long, but it is about very very little effort. Because of the long proving process the dough is beautifully light and airy with very little effort. Also it has a higher water content than conventional bread recipes so you get a beautiful crisp crust. This recipe comes from the New York times so my measurements are in cups, apologies to those in the UK! I believe you can buy cups in John Lewis, Lakeland and some supermarkets now. I got mine on ebay for about £5. 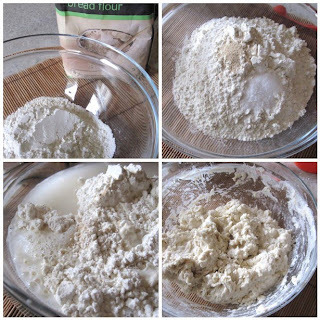 Put your flour in a large bowl, add in the yeast and the salt. Then add in your water and stir until you have a soft sloppy dough, like a very thick cake batter. Add a touch more water if your mix seems a little dry. Then all you need to do is cover the bowl with cling film and leave in a warm non draughty place for a minimum of 12 but up to 20 hours, I left mine for 20 hours. Drop your dough onto a very well floured surface and form into a rough round shape with wet hands. Your hands won’t stick to the dough if they are wet. Drop this dough into a bowl lined with a floured cotton towel. Cover with the towel and leave to prove for 1-2 hours, I left mine for 1 1/2 and it was fine. It should double in size. Half an hour before your dough is ready heat up your pot. Set your oven to gas mark 8 / 450f / 230c. You need to use a thick strong pot, such as a casserole dish, with a lid. I used a big stoneware dish. If I had a Le Creuset it would be perfect for this! When your dough is ready add it to your pot. The recipe I used said to line with greaseproof paper if your pot isn’t non stick, unfortunately I did this (and floured the paper) and the dough stuck! So I would recommend oiling your paper or just flouring your pot very well. Bake your loaf for 30 minutes covered, then for another 20 minutes uncovered to crisp the crust. It should sound hollow when tapped on the bottom. Leave to cool for 5-10minutes afterwards, then slice into big chunks and serve with proper butter!